Wastewater treatment polymers remove solids from water by means of both coagulation and flocculation. It would be well if we first provided definitions for both coagulation and flocculation. The terms are quite different, however, are often used interchangeably. Here are the layman’s definitions of these two very important terms describing water treatment polymers. Flocculation refers to the precipitation of suspended solids from water by gravity. This definition is both simple and accurate. Coagulation refers to the elimination of the electrical charges of repulsion surrounding particles in suspension. This definition does not mean that suspended solids have been precipitated. That refers to the above definition of flocculation. It can only occur once the suspended solids have been coagulated. 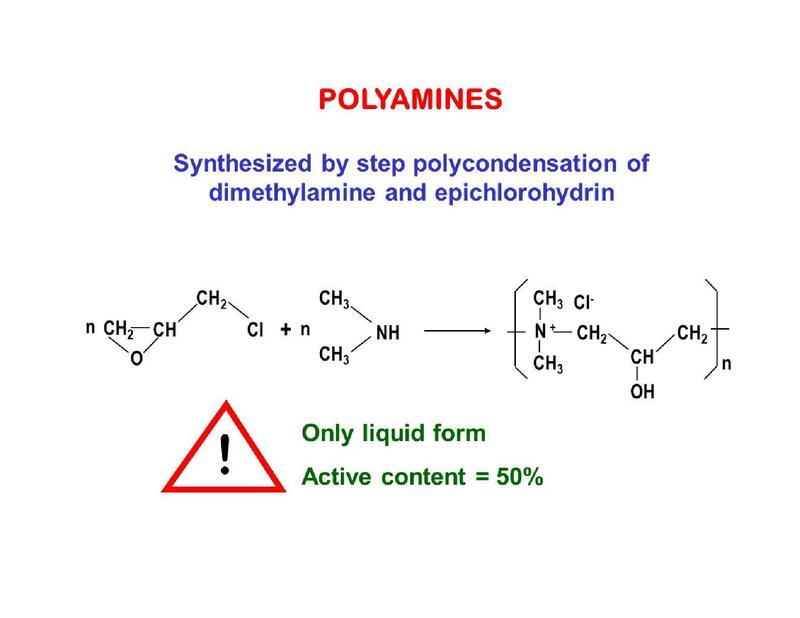 It is not uncommon in water treatment polymers that solids in suspension require a coagulant first in order to eliminate the charges of repulsion so that the solids can then be traded next with a flocculant. It is only then that the flocculant can perform its job of bringing together the small masses of suspended solids such that the weight of those masses overcomes gravity. So the reader can now see that water treatment polymers can react in two different but related fashions to clarify water streams and to dewater sludges and slurries. As we discuss the types of coagulant sin types of flocculants and their functions we will base our comments on the above definitions. Please also see our technical paper entitled “Water Treatment Dictionary” in the product data section in our website. In the section discussing water treatment polymers we will describe the types of coagulant’s used in various processes. Coagulant’s are positively charged species which allow suspended solids to precipitate with or without the aid of a flocculant. Primary coagulation’s are described as metal salts of iron or aluminum. Common names for such primary coagulants are ferric chloride and alum, also known as, aluminum sulfate. These primary coagulants are commonly used in potable water treatment, the mining industry and other applications. There are many applications in which a primary coagulant, the inorganic coagulates, will function effectively without additional reagents. Primary coagulant’s are normally furnished as high density solutions because the dilution of powdered or granular coagulant is quite difficult. There is another category of coagulants which can be referred to as coagulant aids. This group of water treatment polymers consists of organic coagulants which are not minerals as are the primary coagulants. This group consists primarily of dadmac and epi coagulants. 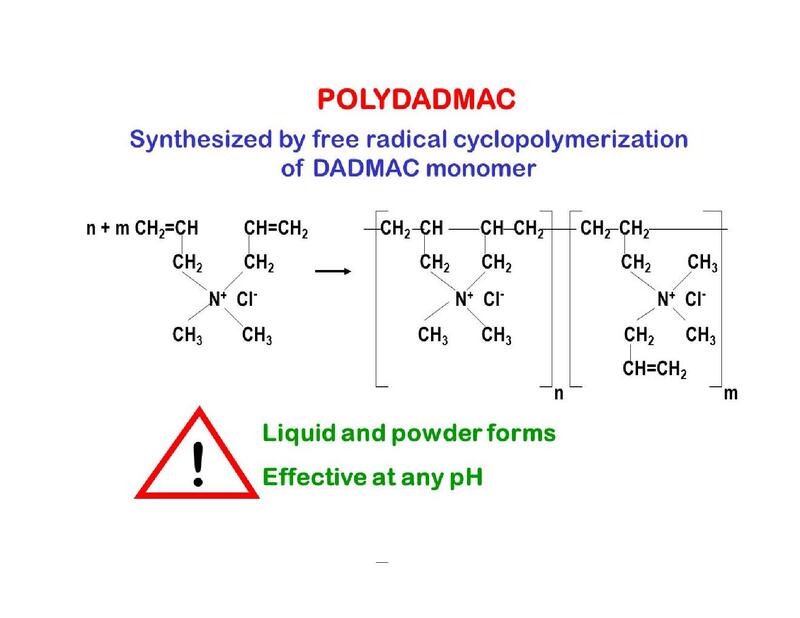 The dadmac designation refers to poly diallyl dimethyl quaternary ammonium chloride compounds. The epi designation refers to epichlorohydrin/alkylamine compounds. There are some applications which require the use of both a primary coagulant and anticoagulant aid in order to achieve the desired level of solids’ precipitation and supernatant clarity. Supernatant is another water treatment polymer term for clarified water. In a small number of water treatment polymer applications it can be required that a coagulant is followed by a flocculant in order to achieve the desired water quality results. This is often referred to as a dual polymer or the “Coagulation and Bridger Approach.” This is a common treatment modality when colloidal suspensions of solids are present and may have been formed by a the function of surfactants or other emulsification agents which are part of the industrial process. In the product data section of our website this approach is discussed in more detail. Organic coagulates are furnished as concentrated solutions because of the manufacturing process. The exception is the dadmac product which is available in both granular and bead forms. Extremely high volume consumers such as mines usually prefer the granular or bead form. There is a subset in water treatment polymers consisting of both primary coagulants and coagulant aids which are blended together. The combination of the two types of coagulant’s can produce a special synergistic activity which promotes better results than applying only one type of coagulant. Jar tests are the best way to determine if the Coagulation and Bridger Approach or a coagulant blend will be the most effective treatment modality for a specific application. The simplest and most direct manner in which to categorize flocculants used to identify each of three types by the nature of the electrical charge carried on the molecule. The charge may be positive which designates the water treatment polymer as a cationic flocculant. 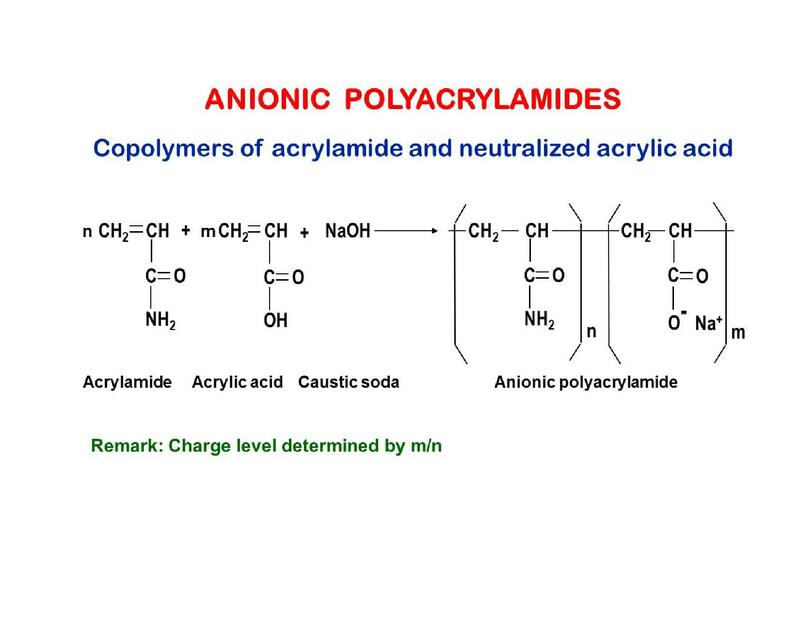 The charge may be negative which designates the water treatment polymer as an anionic flocculant. The charge may be neutral which designates the water treatment polymer as a nonionic flocculant. This is a simple and accurate designation of the type of flocculant and one may think of the flocculant charge as similar to the terminals of an automobile battery. One terminal is positive and one terminal is negative. Cationic flocculants are attracted to negatively charged suspended solids. Anionic flocculants are attracted to positively charged suspended solids. Nonionic flocculants are generally attracted to suspended solids which have no charge for a very slight charge. Generally speaking cationic flocculants are applied to precipitate organic solids such as food and food byproducts. Anionic flocculants are applied to precipitate inorganic solids such as minerals and metals. In order to zero in on the exact category of flocculant that we might consider for specific application, we first consider the charge type which is discussed in the previous paragraph. Now we need to discuss the physical form of the flocculant. 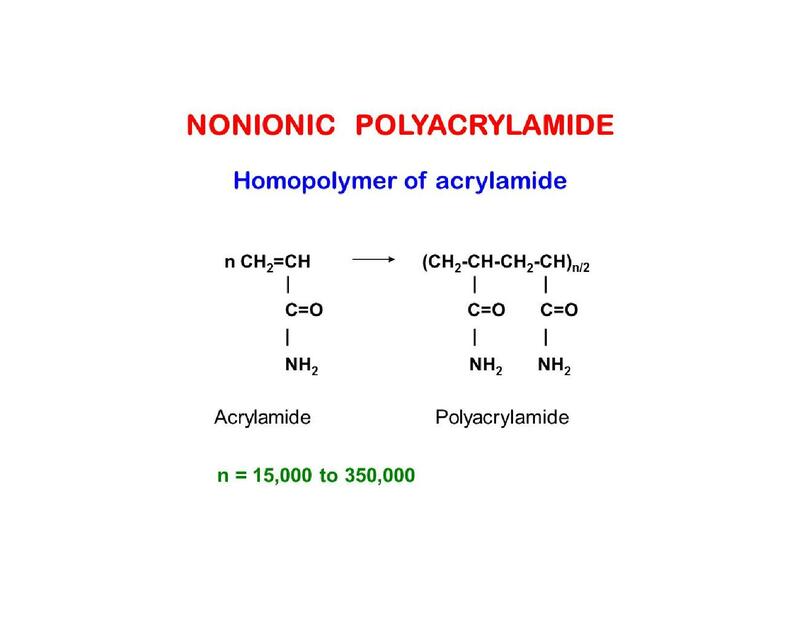 There are two broad categories of the physical form of water treatment polymers and there are several subcategories. The first blog category is liquid. Our definition of liquid is flowable. There are four subcategories of liquid flocculants. The first is the solution flocculant. It has an activity level between 1 and 2% by weight. This liquid form is not commonly applied and has special application in low-volume processes, such as closed loop water systems. The second is the emulsion flocculant. This is the most common liquid form applied. 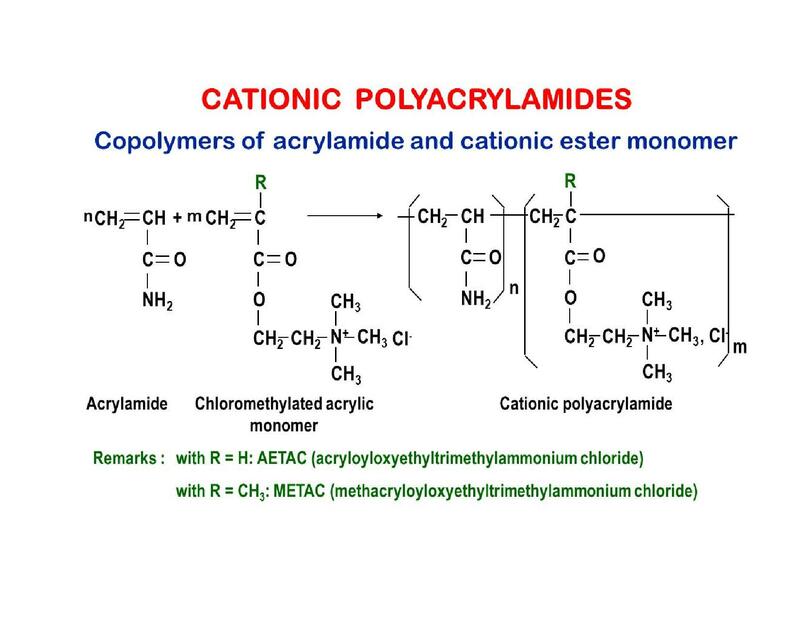 Cationic emulsions range from 35 – 45% activity and anionic and nonionic emulsions range from 25 – 35% activity. The activity levels are limited by the viscosity which is proportional to the molecular weight of the molecules. The third is the dispersion flocculant. There is a specific manufacturing process which will allow flocculant solids to be dispersed rather than emulsified. Dispersion plot killings can have activity levels of approximately 50%. The fourth is the dewatered flocculant. This flocculant is prepared with a reduced level of water so that the solids level can be constructed to 50% and somewhat greater. This physical form can be useful to minimize dosage requirements in high-volume applications. The three charged types of flocculants are also produced in the dry form. There are five subcategories of the dry form. Due to special factors in various applications, it becomes most practical to use a dry flock you like instead of an emulsion flocculant. The first form of the dry flocculant is granular. The particle size of the granular flocculant is similar to granulated sugar. There are available dry flocculant mixing and blending systems to handle virtually any volume of dry flocculant and there are many variations of such systems. Our website has a technical paper discussing water treatment polymer theaters. The second form of the dry flocculant is powder. The particle size of this form is similar to talc. Some flocculant applications require powder for quicker wetting than the granular form. The third form of the dry flocculant is bead. This form is preferred when the application requires an absolutely uniform dissolving rate of the dry flocculant. The fourth form of the dry flocculant is the tablet which is produced from any of hundreds of granular flocculants period the tablet is frequently the form of choice for certain applications in which there is a limited supply of manpower or matériel. The fifth form of the drive flocculant is the log. The log finds most of its applications in the erosion control and construction industries in which there is a remote application site and also a minimum of manpower and matériel. Consultation with and jar testing performed by a qualified flocculant supplier can result in the selection of the proper charge type and physical form of the flocculant. Our water treatment polymers are available in a wide variety of physical forms, packaging options and delivery methods to meet the usage requirements of quite modest up to daily truck load customers. Please contact our sales department at water@tramfloc.com for further information about water treatment polymers’ samples, product selection, budgetary estimates, quotations and technical recommendations.